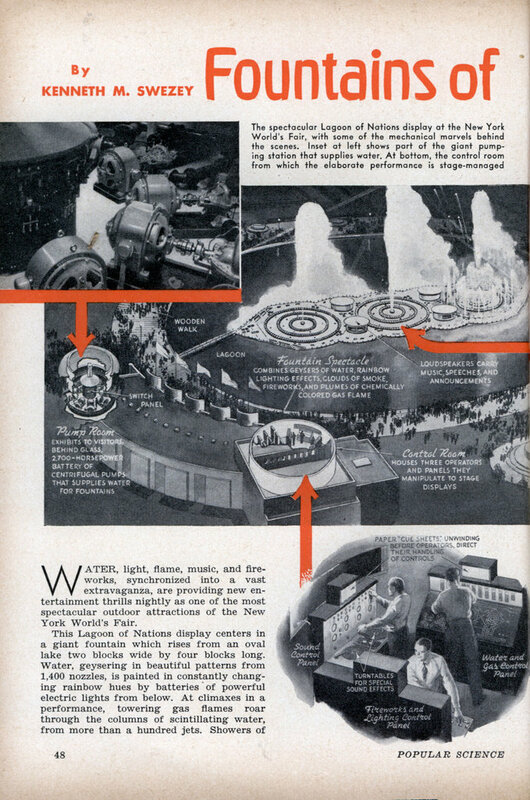 WATER, light, flame, music, and fireworks, synchronized into a vast extravaganza, are providing new entertainment thrills nightly as one of the most spectacular outdoor attractions of the New York World’s Fair. This Lagoon of Nations display centers in a giant fountain which rises from an oval lake two blocks wide by four blocks long. Water, geysering in beautiful patterns from 1,400 nozzles, is painted in constantly changing rainbow hues by batteries of powerful electric lights from below. At climaxes in a performance, towering gas flames roar through the columns of scintillating water, from more than a hundred jets. Showers of fireworks burst overhead. Stirring music thunders an accompaniment to the display from the heart of the fountain. The whole complex mechanism is “played,” as if it were some mighty organ, by three operators at electric consoles located in a near-by tower. Regular programs, based on such themes as “The Spirit of George Washington,” “Creation,” “Isle of Dreams,” “Fire Dance,” are presented to tens of thousands of spectators each evening. Every performance is as carefully designed, staged, and rehearsed as a Broadway show or a grand-opera production. After a theme is selected, Jean Labatut, professor of architecture at Princeton University, makes sketches indicating the desired shape and color of the fountain and noting fireworks creations where needed to express the changing moods of the theme. These sketches are given to Russell Ben-nett, composer, who writes and arranges music to harmonize with them. Next, John Craig, expert pyrotechnician, is called in to create fireworks to meet Professor Labatut’s exacting demands. Not only must these explode with the colors and patterns desired, but they must be almost noiseless, so that the music may be heard above them. Their charges must also be precisely calculated so that no dangerous sparks will overshoot the lagoon. Designing work finished, technicians translate the drawings into elaborate combinations of settings of switches, buttons, and dials. These, through valves, electric impulses, and sparks, control the fountain jets, regulate the color of the lighting, ignite gas flames and fireworks. So that sequences during a performance may be exactly timed, the settings are marked by means of symbols on long paper cue sheets which unwind slowly, on rolls driven by synchronous motors, before the various operators. 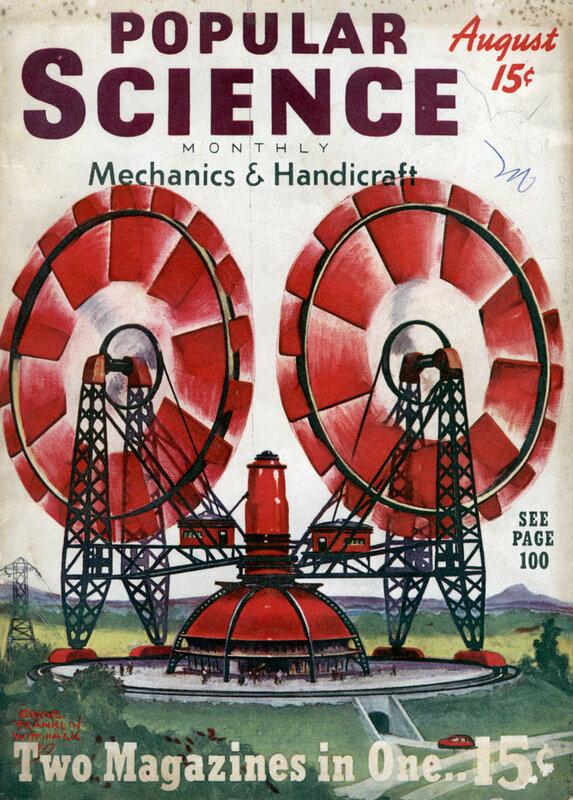 Created under the direction of Bassett Jones, electrical and lighting engineer, this powerful new instrument of entertainment cost $650,000, and required more than a year and a half for experimental work and construction. Hydraulic engineers, gas-company chemists, fireworks manufacturers, illumination authorities, display designers, architects, color experts, and artists have all collaborated. A quick survey of the mechanism reveals some almost incredible figures. Mounted on a 500-foot timber platform, on the bottom of the lagoon, sixteen carloads of piping and two carloads of hydraulic valves deliver water to 653 vertical nozzles, arranged in geometric patterns, and to 812 atomizing nozzles which outline the entire fountain. A 2,700-horse-power battery of electrically driven centrifugal pumps, in a circular glass-inclosed pump-room near-by, supplies these nozzles with 280 tons of water a minute. When a script calls for it, water from a central nozzle may be spouted skyward 180 feetâ€”as high as a fifteen-story building. Two other jets reach 150 feet, while the largest circle of nozzles, which forms among other figures a sheaf of golden wheat ninety feet in diameter and ninety feet high, can hurl its cylinder of water into the air with the force of sixty-two modern fire-fighting engines! Lighting the water with more than 2,000,000 candle power of beautiful pastel colors is accomplished by a battery of 585 huge lighting drums, almost completely submerged, and by hidden searchlights that illuminate the tops of the highest jets. Each drum contains two projector units, one powered by a special 400-watt mercury arc lamp and the other by a 1,500-watt tungsten lamp. About each projector unit revolves a hexagonal color wheel, driven remotely by a synchronous motor that turns the wheel at one revolution a minute. By combining, for the first time, the spectra of the two types of lightâ€”the mercury arc extending deep into the blue-violet, and the tungsten into the redâ€”gorgeous new pinks, blues, and crystal whites are obtained, surpassing any previously possible. Three hundred fireworks mortars and smoke machines, touched off by electric sparks, and 135 huge gas jets capable of spurting chemically colored flames thirty feet high through the cascades of water, bristle among nozzles and lighting drums. So great is the consumption of gas by these latter jets, that two gas companies unite their facilities to supply the amount needed during a half-hour performance! To obtain greatest realism in the audible part of the display, “canned” sound has been banned from the feature displays except for special effects. In a building several blocks from the fountain, a forty-two-piece band, an electric organ, or a fine carillon plays into two microphones separated, so as to pick up the tones from two different points. The music is timed by means of a fourth cue sheet, synchronized with the three in the control room. The hookers in the floating bordello (above) offered to create a Fountain of Flame from my pipe organ…. I saw Fountains of Flame in concert once. Awesome performance.